Wednesday 7th October proved to be a very bleak, wet and rainy day, but, initial curiosity having by now been replaced by a growing sense of purpose, photographers intent on creating historical record are not to be put off. The old Church High building looked far from happy today; however, as all writers know, background weather can make the world of difference to the mood and tone of any scene. Nonetheless, it was hard to shake the word ‘dismal’ from the mind. The scaffolding rubbish chute was now complete and appeared to be ready for action. 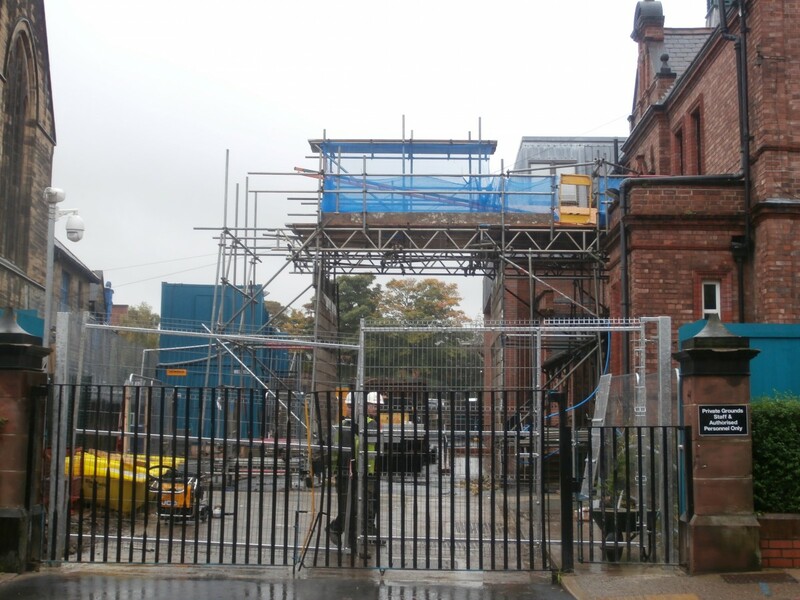 It was noticeable today that there were now two layers of metal gating in situ, the black Church High staff car park gates standing out in stark relief against lighter, brighter new ones; the bent centre metalwork had not been obvious before this and made it look like at some point there had been a ‘run’ on the gates. The old black metal Church High car park gates are still in situ. Behind them is the completed rubbish chute. 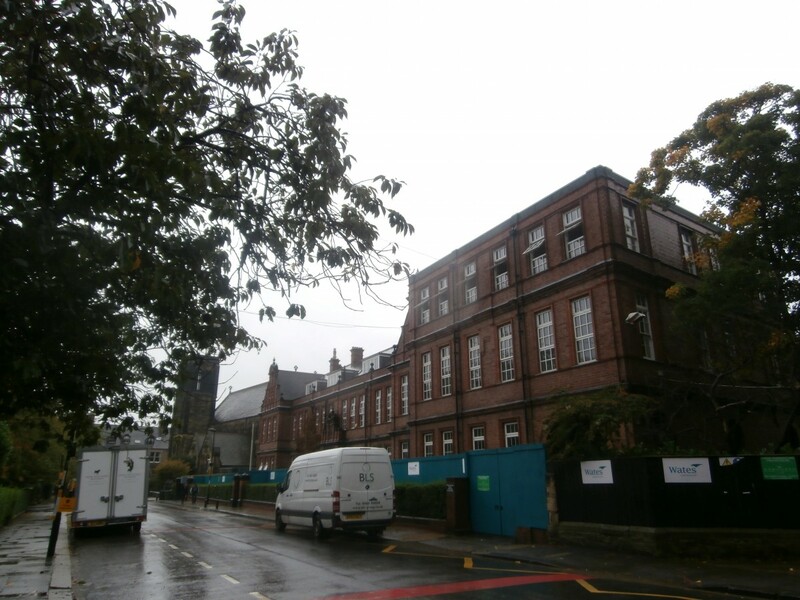 The row of white windows flung wide open, presumably to dispel the dust, and loud banging noises emanating from within indicated that the reconfiguration work of knocking down internal walls had by now progressed along the third floor top corridor to the ICT Suite. Open windows denote work has moved on to ICT Suite. 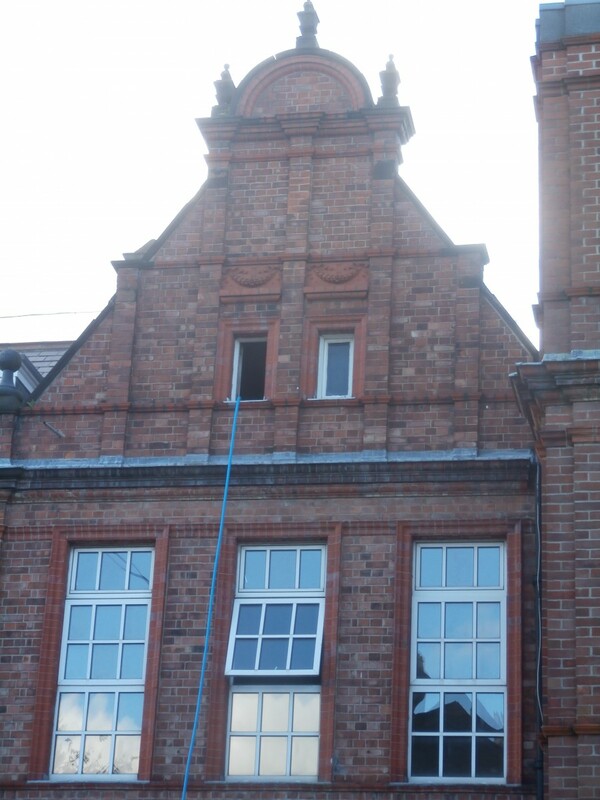 A big, thick, bright-blue cable (the colour the Church High front doors were painted when I joined the school in the 1980s), now a permanent feature of the school frontage, was fed through a small window in one of the original building’s red-brick gables and made it clear how all the power needed for this work was being supplied. The curious knock-on effect of this was to draw attention to a tiny little room hidden away in the eaves whose existence would have been largely unknown to many pupils and staff otherwise very familiar with the Church High building. Originally, these upper rooms were used by domestic staff, but latterly this one, accessible only via a little hatch in the wall at the very top of the main staircase, was where the main IT servers were situated to keep them cool. The power supply drawing attention to the ‘secret room’ hidden in the eaves. Other than this, from the outside not much change could be discerned in the old building today, but it is funny how being forced to focus on a limited area of something either allows one to notice new features in it or can bring forgotten things back to mind. An observant sound engineer I spoke to in April, up here testing the internal walls of the old building, had noticed that the rectangular end section of the main façade was made of newer bricks and I was able to confirm that it was indeed a 1930s extension. 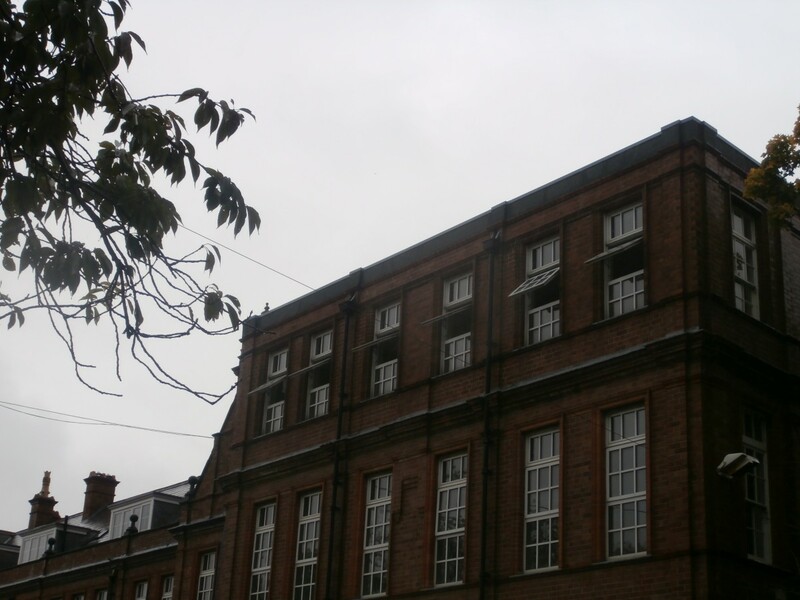 But it would take a very observant person – or someone who knew the School’s history very well indeed – to notice that the third floor of this extension, although very well-matched, is actually made of different bricks again. Our main ICT Suite was originally the old School Library – a much-valued and long-awaited library which was finally brought into being in 1935 after a protracted period of fundraising on the part of governors, staff and girls alike. 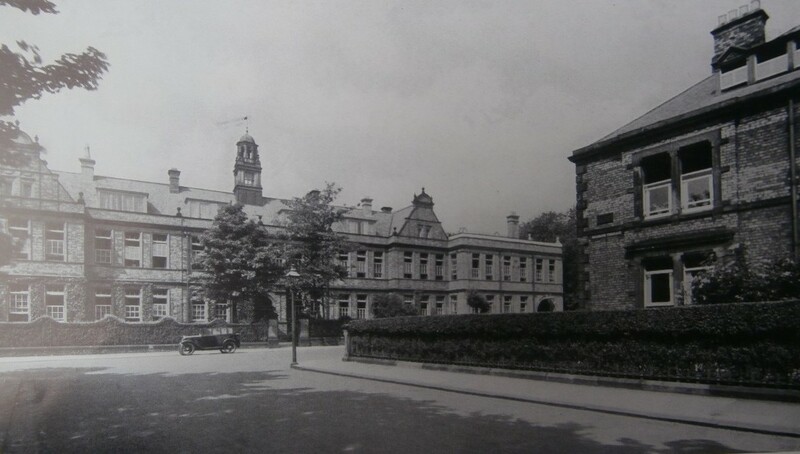 The earlier two-storey extension is clearly visible in this early 1930s photograph of the Church High School frontage viewed from Haldane Terrace. The Church High frontage c 1930 clearly showing the new two-storey extension & the bell tower still in situ. 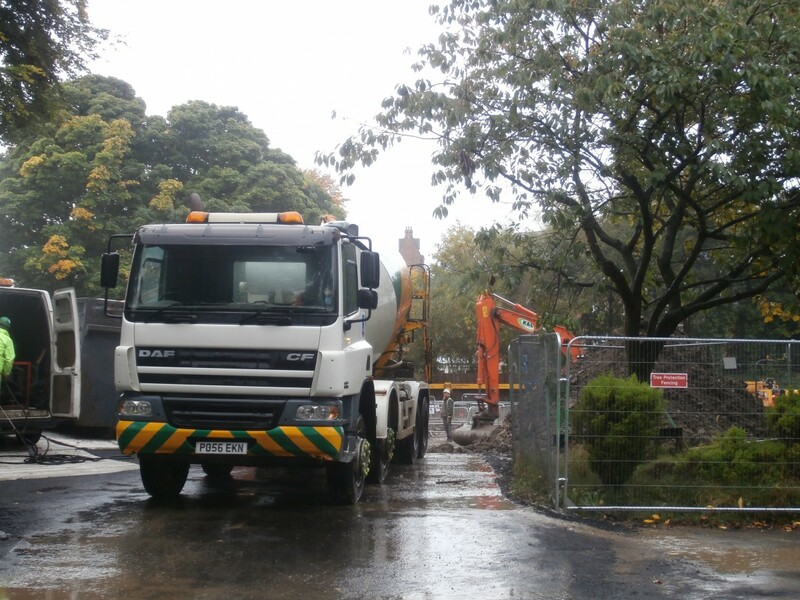 A clear view of the Junior School grounds was blocked by a lorry today, but, beyond it, it was just possible to see that the piles needed to support the weight of the new build steelwork were being dug. Work underway driving in the piles for the new build.